A nurse draws blood from a student in Flint, Michigan, to test for lead poisoning. Over the weekend, I gave my eight-year-old nephew his first lesson on lead poisoning. He had never heard of the toxic metal, or the ways it can enter the bloodstream and lead to decreased IQ scores in kids and joint pain in adults. I’m sure neither had the children of Flint, Michigan—at least not until a major water crisis hit their predominantly black hometown. A study out in the Journal of Pediatrics Monday looks at how blood lead levels in Flint’s children five years old and younger fluctuated before, during, and after the water crisis, which began in 2014. In short, blood lead levels have been decreasing since 2006, when the database at the Hurley Medical Center in Flint first began tracking this data. This is good news, but as the researchers with the University of Michigan and Rutgers New Jersey Medical School emphasize in the study, no amount of lead in the blood is safe. “The ultimate goal is to bring the level down to zero in all children regardless of demographics—quite a task indeed,” lead author Hernan Gomez, who is an associate professor at the University of Michigan’s medicine unit, told Earther in an email. Still, Gomez emphasized that Flint children should not grow up with the “false stigma,” as he put it, that this water poisoned their brains. The blood lead levels at the time of the water crisis were actually some of the lowest the city’s seen in a decade, despite the water contamination. Levels have been historically higher because of how lead was so woven into infrastructure, including gas and paint, which cities (including Flint) have been effective at reducing, Gomez explains. “Just because levels were higher in the industrial past, does not mean that current levels are not concerning,” Mona Hanna-Attisha, a pediatrician at the Hurley Medical Center who didn’t work on this study but helped expose the crisis back in 2015, told Earther in an email. At the height of the crisis in 2015, according to the 15,817 blood samples the team analyzed, the mean blood lead level was 1.3 micrograms per deciliter. This was 0.11 micrograms higher than in 2014 before the city switched water sources (which contributed to the water contamination) but still below the 5 micrograms per deciliter threshold where the Centers for Disease Control and Prevention recommends public health action. Between 2010 and 2011, the city saw a spike similar to what struck Flint during the water crisis, though that cause remains unknown. 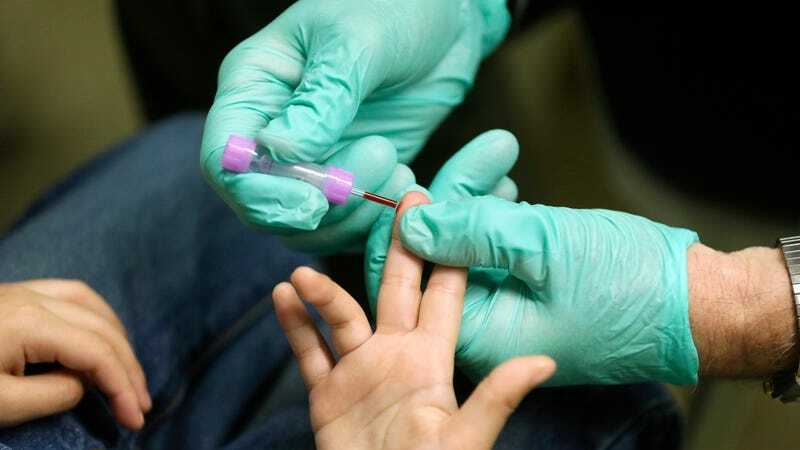 During the crisis, according to the study, no blood sample reached lead levels of 45 micrograms per deciliter or higher, the point where the CDC suggests chelation therapy to remove lead. Nor was any child was hospitalized for chronic lead toxicity. This news—albeit refreshing—is not complete. This information lacked demographic data like race and class because the Hurley Medical Center’s database didn’t track that until 2012. The study is also clear that this data encompasses about half of Flint children. So there’s a whole other cohort of kids whose blood samples didn’t make it into the study, including many babies younger than one year old whose meals likely consisted primarily of water-based formula. That’s part of Hanna-Attisha’s criticisms: the “massive underestimation of exposure.” Because lead was transmitted through water, not only were infants impacted, but so were their unborn peers still in vitro whose mothers were likely consuming this water, too. Plus, these little ones were largely excluded from the city’s blood screenings during the crisis but before residents knew about it. “Thus, because of this massive underestimation of exposure—children were not screened during peak exposure and not screened at the younger ages most impacted by lead in water—it is critical to look beyond blood screening rates to determine the exposure and necessary response,” she told Earther. Hanna-Attisha would rather see environments researched, not just children. The goal is prevention and remediation, not just detection. “When we detect lead in a child, it is only alerting us to an environmental problem,” she explained. That problem could be hiding in the paint on a wall, the soil in a backyard, or, as Flint reminded us, the water dripping from a faucet. And while she’s celebrating the decrease in blood lead levels in the decade since the city began tracking it, she’s also wary of getting too excited. The drop could be due to screenings increasing in the city. The study doesn’t acknowledge this, so Earther is awaiting a response from the study authors to confirm whether this was taken into account. Criticisms aside, this study—and the historic tragedy that spurred it—launched a conversation Gomez hopes is just the beginning.